Brunnera plants and species such as Brunnera macrophylla and B. macrophylla ‘Variegata’ are popular shade flowering plants well suited to a woodland situation, also commonly known as Siberian Bugloss and False Forget Me Not..
Characterised by blue flowers held above the foliage in spring. These plants are an excellent addition to a shady position where they will form a clump of around 50cm wide. These great foliage plants work well with other shade loving plants such as Hostas, they are lower growing that many other shade plants and make an interesting border plant when grown along a pathway. 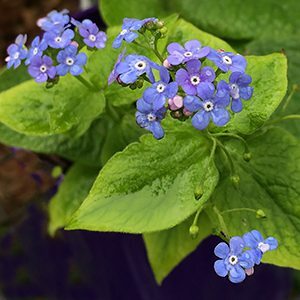 Cultivars such as Brunnera macrophylla ‘Jack Frost’ are grown for the foliage as well as the dainty flowers. ‘Dawsons White’ has a creamy white leaf margin with a distinctive mid to deep green centre. B. ‘Langtrees has heart shaped foliage splashed with a silvery white pattern near the leaf margins. We have found that these are very easy care plants for semi shade. They will spread to form a good clump over time, however they are certainly not invasive in our garden. They will die back in winter, however as spring comes around the foliage provides great color right through until autumn. They do grow best in a humus rich soil amended with plenty of well rotted compost and a little aged cow or sheep manure works wonders. 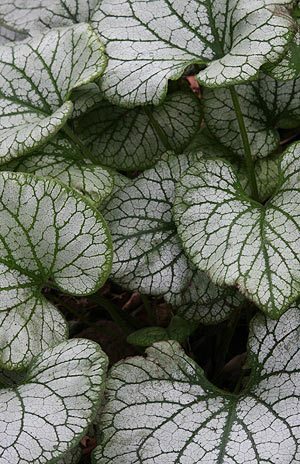 In warmer seasons Brunnera seem to maintain foliage almost year round, in colder winters they tend to go dormant. Soil – Humus rich moist soil, well drained.